January gave us some proper winter weather and subsequent challenging harvesting conditions. The frosty mornings meant many crops were still frozen until 11 or 12, so less time in the day to harvest (and then pack). We did get a few hours of lovely sun most days though, when we had to strip off a few of our many layers of clothing! You may have heard about various veg shortages in January due to unusually bad weather in southern Spain, where a lot of the UK’s out-of-season crops come from, for example, lettuce and courgettes in January. First of all, our sympathies are with the Southern European growers who have lost their crops, and with their workers. Not sure if the severe weather they've experienced was due to man-made climate change, but the clamour to replace the lost crops with ones flown over from the US will surely contribute to it! Our January weather was what we’d expect and it has taken its toll on some of our leafy greens and salads, so they are all less plentiful now. 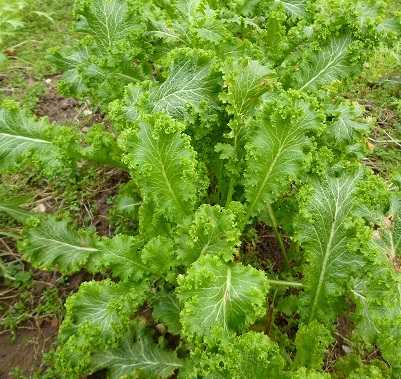 We do rely on perpetual spiinach, which is much more hardy than annual spinach though, and our winter salad bags get spicier with mustard leaves and the sweeter kales replacing lettuce.